Hi, could someone tell me where would I coorectly apply my jackstands. Also, is this circular thing at the front of the car the place where I should apply my trolley jack? That rib along the right in the first picture is a reinforcement. You can also go under those bolts in the last picture. Great question and no one size fits all answer so helps to have a strong clue in what should be plenty strong. Yes - what a vehicle maker says on where to use its own jack for a flat tire for instance is fine (usually if not too rusty on some) but doesn't go on to where you would place a stand. It totally matters! Stand quality, surface it is on too plus level surface IMO best is concrete or use high rated plywood on asphalt very important in warm to hot conditions or if more than a few minutes! Plain bicycle kick stands can sink in but that a bicycle not life threateningly heavy. OK - Lood at what looks like frame welded to floor pan. Looks like it's dented a bit now as if things have been placed in the wrong spot on this before in my view. Towards front the metal is doubled up and should be strong as well as on this style the lower lip behind if that is showing front left tire view should be strong and doubled up with metal and the common spot junky jack of vehicle with its spare would go. If at all possible leave jack AND jack stand both. OK with me to also place whole wheel and tire on side as well if any doubt might allow your life in a failure. When in doubt don't! 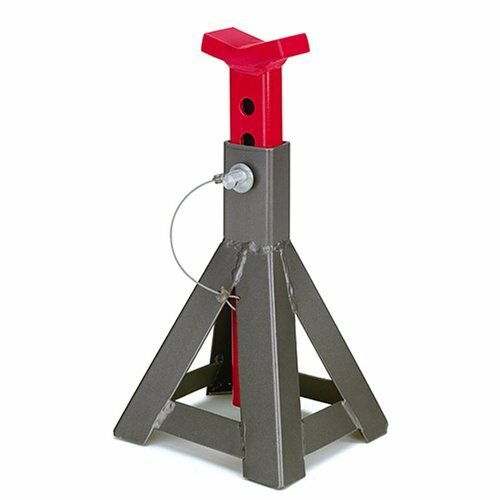 Know that common floor jacks with four wheels that you may use needs to be able to roll on its wheels as weight is lifted. Note the full up position of lifting cup is not in the same place as fully down and needs to accommodate that. Think, think, think before you get under a vehicle that is hoisted! If enough I'll close thread and ask any moderator if you need it re-opened. If I confused anything you do know you need two spots, one for jack and other for stand. If in any doubt ask a real tech and have a tire marker for spots or something. No guessing, know where and right stands not stamped steel ones but better than that type. AGAIN - LOOK AT THE PICS NOW. LOOKS PRETTY SURE IT HAS BEEN HOISTED OR SUPPORTED IN WRONG SPOTS ALREADY WITH DENTS IN FLOOR SUPPORT TOO FAR AWAY FROM CORRECT SPOT. Accident or hoisting issue unknown. Any readers: Vehicle makers near always have clear instructions on plain changing a tire and where to place that jack but not for safety stand(s) as well in owner's manual and or on or near spare tire cover if applicable. DON'T GUESS - KNOW FOR SURE!